Bedford Blues return to Championship action this afternoon with a trip to face London Scottish. 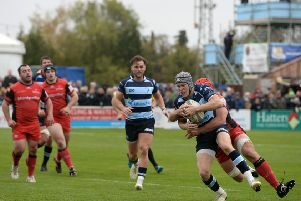 While the Blues did not have a league game last week due to London Welsh’s departure from the Championship, Bedford were in action as they took on Northampton Saints in an enthralling encounter at Goldington Road. Despite losing 52-17, here were plenty of positives for the Blues to take into this weekend’s fixture. The reverse fixture in November ended in a 13-10 loss for Mike Rayer’s men despite them dominating large portions of the game and the Blues will be hoping not to let the same happen again this time around.